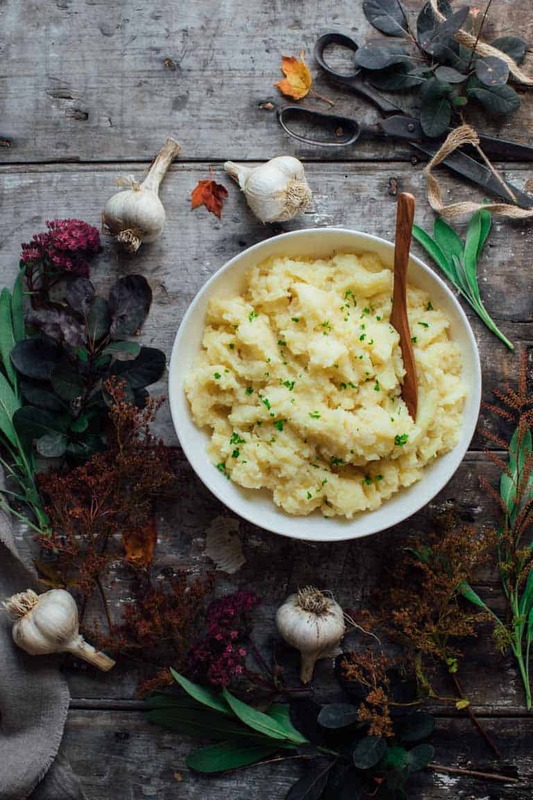 If your family is anything like mine, your Thanksgiving table would not be complete without mashed potatoes. 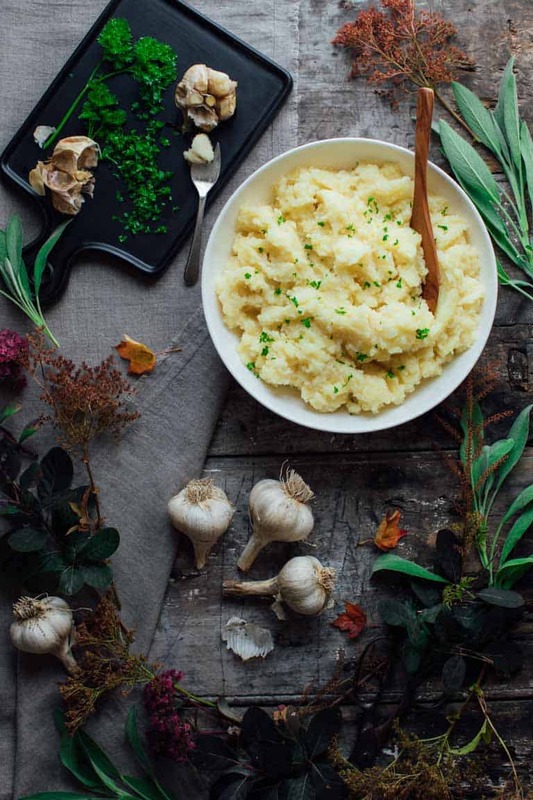 Well, then you don’t want to miss these Healthy Roasted Garlic Mashed Potatoes! They may be lighter in calories with non-fat plain yogurt, but they are far from light on flavor with layer upon layer of yummy garlic! I originally shared this recipe on November 9, 2010. I have updated the images and some of the text today. As with most families, mine has its Thanksgiving traditions. After the marathon of cooking is done, the table is set and the candles are lit, we join hands for a moment of silence. And then the feasting finally begins. But in our family my dad stops us just as soon as we’ve hit our stride to ask us one question “What was your first bite?” We always roll our eyes and then go around the table confessing what we’ve eaten first. As annoying as this tradition is, it actually is quite interesting. Believe it or not, rare is the diner who has tasted the turkey first. I know I’m not one of them either. In fact, most people, myself included, go for the mashed potatoes (and gravy) for their first glorious bite. I mean, after skipping lunch and nibbling on nothing more than crudites and cocktail onions, you want to go for the good stuff, right? So this year, I am making the mashed potatoes even more irresistible and memorable. But you know me, I can’t bring myself to do that by weighing them down with a boatload of butter. The trick is to add flavor instead. Roasting a few heads of garlic ahead of time (even a day ahead is fine) makes for a creamy and rich flavor enhancer without a ton of extra calories. I also toss a couple of crushed garlic cloves in with the boiling potatoes to layer the garlic flavor. Then I also use tangy plain yogurt instead of cream. 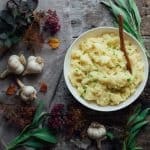 With all of the flavor in the mash you’ll only need a touch of butter. Don’t forget to check out a few of my other Thanksgiving side dish favorites! And you can find tons of vegetable sides, pies and stuffing here when you cruise all the Thanksgiving archives. Thanks so much for stopping by! 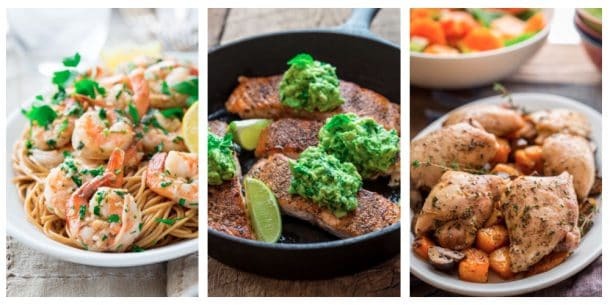 Please let me know if you try this recipe by leaving a comment or rating below! I love hearing from you. And if you haven’t already I’d love it if you signed up for my weekly email newsletter. 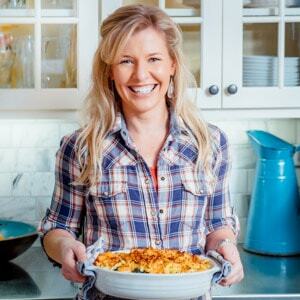 I send one out every Saturday morning, so you never miss a healthy recipe! 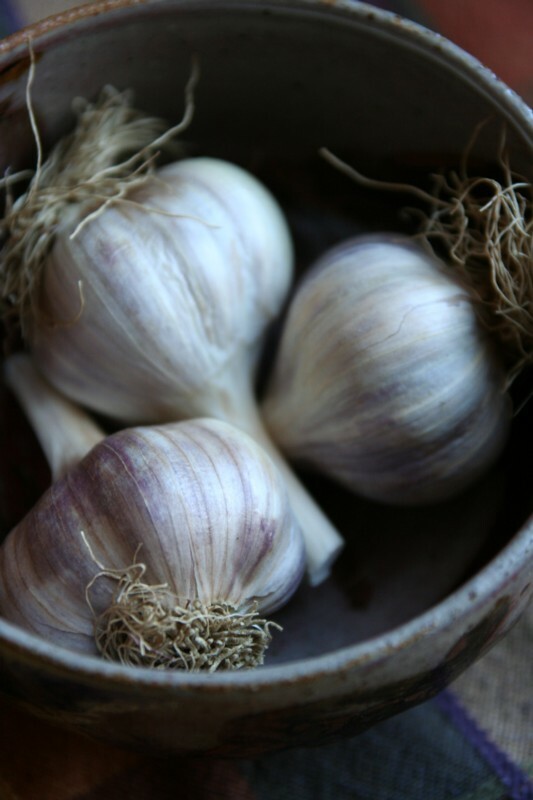 Preheat oven to 350 degrees F. Prepare two heads of garlic for roasting: Leaving garlic head intact, cut tip off of garlic cloves, exposing the flesh of each clove. Repeat with the second head of garlic. Place the heads root-side down on a sheet of aluminum foil. Drizzle oil over the exposed flesh. Wrap up the heads into a bundle and bake until fragrant and the garlic is tender, about 45 minutes. Open packet to vent and set aside to cool. 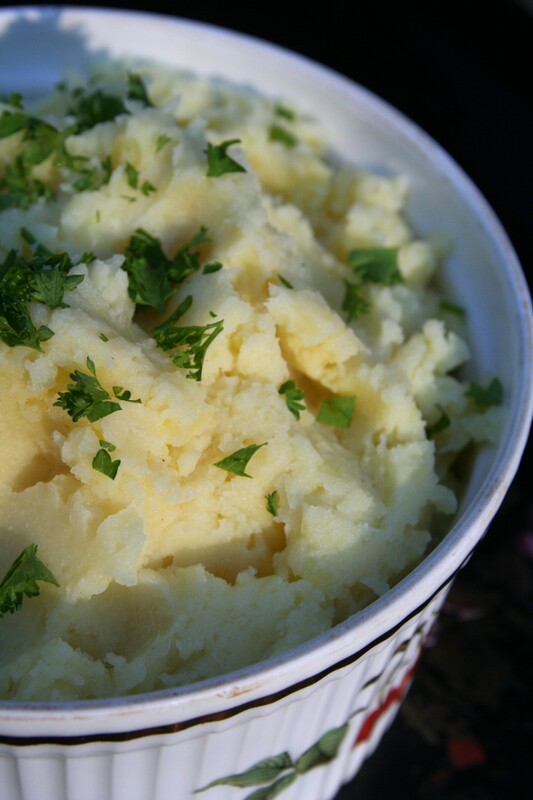 When the garlic is cool, squeeze the garlic out of the skins into a bowl and mash with a fork into a smooth paste. Mash in butter, pepper and the remaining 1/2 teaspoon salt. Stir in yogurt. Meanwhile, peel the remaining 2 cloves garlic. 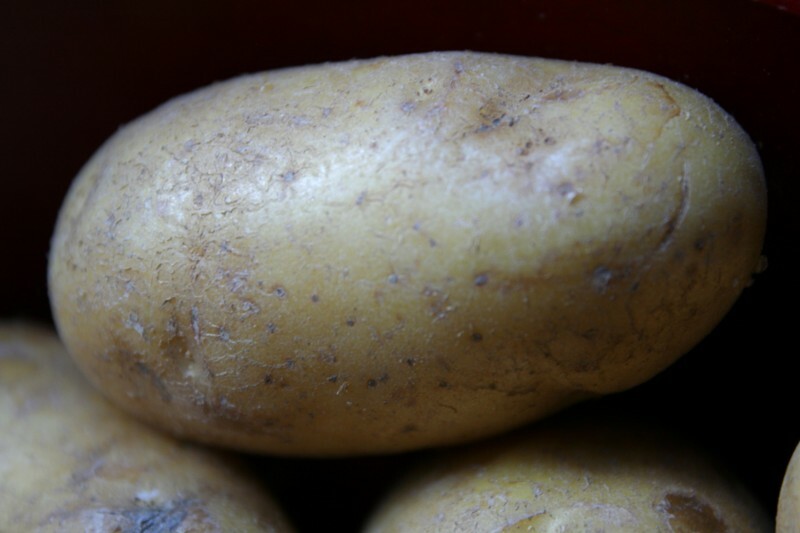 Cover potatoes and the two cloves garlic generously with cold water in a large saucepan. Place over high heat and bring to a boil. Reduce heat to maintain a gentle simmer and cook until the potatoes are tender when pierced with a fork, 15 to18 minutes. Drain and return to the pot. Mash potatoes with a potato masher. Add the yogurt mixture and mash until smooth. Transfer to a serving dish and garnish with parsley. How interesting! And good to know. Thanks for coming by. Love your updated photos! 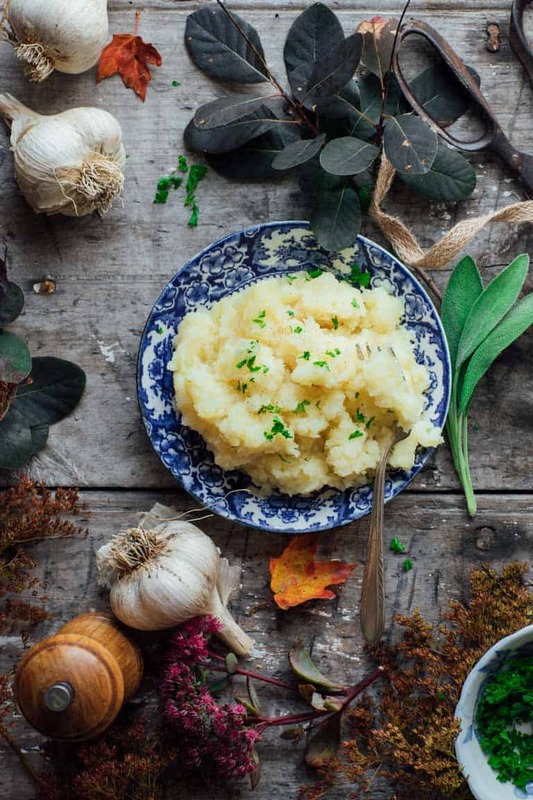 These mashed potatoes look incredible. So perfect for the holidays. Thanks so much Tara! Have a great day. 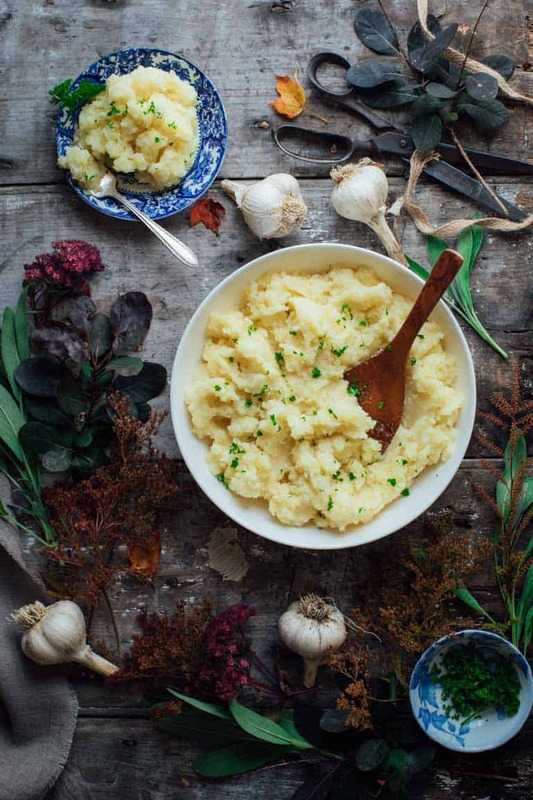 This mashed potatoes recipe looks mouthwatering! Actually I’m craving some right now! Will definitely give it a try! That’s awesome Natalia. Let me know what you think! I love that your dad goes around the table asking what everyone took a bite of first! For me that would be stuffing for sure! And yes mashed potatoes sound delicious! Oh good call- stuffing, mashed potatoes with gravy or sweet potato. Man, it’s always a struggle. Ha ha!